Use Nectifirm for a smooth and beautiful neck. Suffering from a sagging neck, or neck wattles? A fallen chin or a wavering jawline can really make you look old. There’s several factors causing the neck muscles to sag and fat to accumulate. The skin in the neck area gets crepier faster than anywhere else on your body because it’s the thinnest except for your eyelids. Also, as you age, a thin ropey muscle called the platysma splits into a V-like formation to two cords that protrude more and more when they contract. Until now, the aging neck was a particularly difficult area to treat without surgery. Fortunately Revsion Skin Care created Nectifirm®. Nectifirm® is one of the most popular products that Dr. Lisa Bunin carries in her Allentown, PA practice. So many of her patients experience sagging skin especially in the neck area. After using Nectifirm®, 96% of patients experienced a firmer neck. Nectifirm® is the only product on the market that actually addresses the signs of aging on the neck. Nectifirm® rejuvenates the fragile skin on the neck and decolletage by treating it differently than the skin on the face. Nectifirm® caters to the neck specific needs by containing 8 actives that work together to help strengthen the epidermal junction. With continued use, the neck and decolletage will feel firmer, smoother, and hydrated with reduced wrinkling. 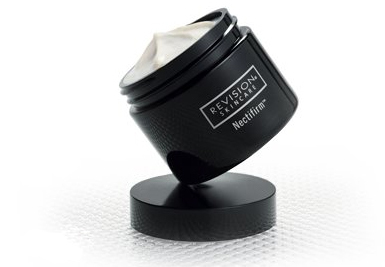 Revision’s Nectifirm® helps the skin appear more firm and lifted while reducing the appearance of rough, crepey skin. It also lessens the look of fine lines and wrinkles. It is perfect for use on all skin types and ethnicities. Backed by years of scientific research, was specifically developed to provide dramatic visual results in the overall appearance of the neck. You will see and feel immediate and long-term results with Nectifirm®. It’s guaranteed.